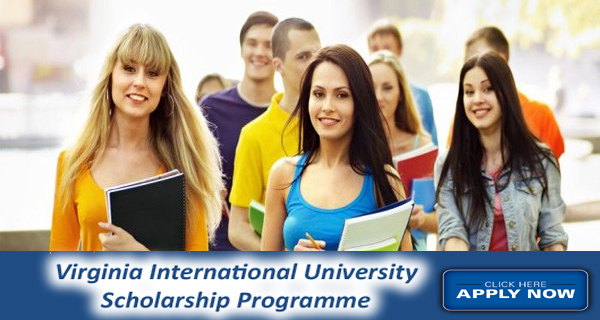 Virginia International University (VIU) offers a unique opportunity to acquire an excellent, multi-disciplinary education at an affordable cost by offering students access to scholarships. The Virginia International University Scholarship Programmes will be awarded to prospective students from 7 regions around the world. Course Level:Scholarships are available for pursuing undergraduate or graduate programme. Study Subject:Scholarships are awarded to study the subjects offered by the university. Number of Scholarships:Total 127 scholarships are available (18 scholarships for each region). Nationality:The US and international students can apply for these scholarships. North America and the Caribbean:17 countries ( Canada, The United States, Anguilla, Antigua and Barbuda, Barbados, Dominica, Dominican Republic, Grenada, Jamaica, Mexico, St. Kitts and Nevis, St. Lucia, St. Vincent and the Grenadines, Trinidad and Tobago, Bahamas, Haiti, Honduras, Belize);Central and South America:18 countries (Argentina, Bolivia, Brazil, Chile, Colombia, Costa Rica, Ecuador, El Salvador, Guatemala, Guyana, Nicaragua, Panama, Paraguay, Peru, Suriname, Uruguay, Venezuela);Sub-Saharan Africa:52 Countries (Angola, Benin, Botswana, Burkina Faso, Burundi, Cameroon, Cape Verde, Central African Republic, Chad, Comoros, Congo Brazzaville, Congo Democratic Republic, Cote D’Ivore, Djibouti, Equatorial Guinea, Eritrea, Ethiopia, Gabon, Gambia, Ghana, Guinea, Guinea Bissau, Kenya, Lesotho, Liberia, Madagascar, Malawi, Mali, Mauritania, Mauritius, Mozambique, Namibia, Niger, Nigeria, Reunion, Rwanda, Sao Tome and Principe, Senegal, Seychelles, Sierra Leone, Somalia, South Africa, South Sudan St. Helena, Sudan, Swaziland, Tanzania, Togo, Uganda, Zambia, Zimbabwe);East Asia And The Pacific:25 Countries (Australia, Brunei, Burma, Cambodia, Mainland China, Federated States of Fiji, Hong Kong and Macau, Indonesia, Japan, Laos, Malaysia, Marshall Islands, Micronesia, Mongolia, New Zealand, Palau, Papua Nova Guinea, Philippines, Singapore, South Korea, Taiwan, Thailand, Timor-Leste, Tonga, Vietnam);Europe And Eurasia:45 Countries (Albania, Armenia, Austria, Azerbaijan, Belarus, Belgium, Bosnia and Herzegovina, Bulgaria, Croatia, Cyprus, Czech Republic, Denmark, Estonia, Finland, France, Georgia, Germany, Greece, Hungary, Iceland, Ireland, Italy, Kosovo, Latvia, Lithuania, Luxembourg, Macedonia (The Former Yugoslav Republic of), Malta, Moldova, Montenegro, Netherlands, Norway, Poland, Portugal, Romania, Russian Federation, Serbia, Slovak Republic, Slovenia, Spain, Sweden, Switzerland, Turkey, Ukraine, United Kingdom);Middle East And North Africa:19 Countries (Algeria, Bahrain, Egypt, Iran, Iraq, Israel, Jordan, Kuwait, Lebanon, Libya, Morocco, Oman, Qatar, Saudi Arabia, Syria, Tunisia, United Arab Emirates, West Bank and Gaza, Yemen) andSouth and Central Asia:13 Countries (Afghanistan, Bangladesh, Bhutan, India, Kazakhstan, Kyrgyzstan, Maldives, Nepal, Pakistan, Sri Lanka, Tajikistan, Turkmenistan, Uzbekistan). Option 3: Provide a high school diploma from a recognized institution in the United States.